"The most interesting development in Northeast Asian security dynamics is that for the first time in the modern era, Korea is the actor leading the momentum towards a significant change, including perhaps an entire shift in the balance of power in the region, instead of one of the great powers," said Balbina Hwang, a visiting professor at Georgetown University. "Historically, this is unprecedented, as for thousands of years, the Korean Peninsula has been the 'pivot' upon which the surrounding great empires and powers used as the turning point for shifts in the region," she added. The road to the unprecedented summit was rougher than initially thought. Until the summit day, Washington and Pyongyang had apparently locked horns over a range of knotty issues, including the sequence and pace of the communist state's nuclear disarmament and security assurances in return for it. Last month, the summit was on the verge of collapse, after Trump abruptly called it off, citing "open hostility" from Pyongyang. But it was later put back on track following the North's conciliatory gesture and the South's mediation. To set the stage for the Trump-Kim summit, and to salvage it later, the South Korean president met Kim in April and again last month, and Trump in May, with his security team maintaining daily contact with its US counterpart. Moon's peace initiative has triggered reactions from other regional powers, such as China, Russia and Japan, that analysts said appeared increasingly leery of the possibility that they could be sidelined -- or left out of the loop -- amid a flurry of diplomacy on the North. Shawn Ho, a security researcher at the S. Rajaratnam School of International Studies of Nanyang Technological University in Singapore, said that Moon's diplomacy and its outcome was "special" in the context of international politics. "President Moon has to be given a lot of credit for his determined, consistent and persistent approach for engaging North Korea," he said during a forum in response to a question from Yonhap News Agency. "I think for President Moon, the inter-Korean issue is a very different issue from any other issues, because it concerns the Korean Peninsula, and it concerns the Korean people. The emotional aspect of it cannot be underestimated," he added. 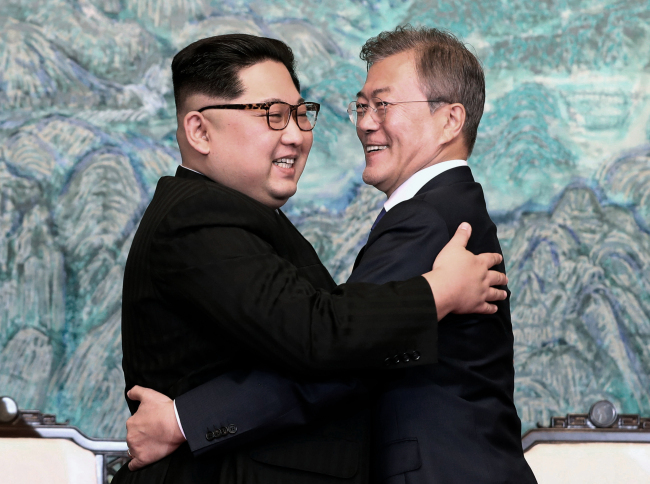 In addition to Moon's efforts to build trust with Trump and Kim, the Korean Peninsula's unique geopolitical location, likely to affect a great-power rivalry, has apparently enabled Seoul to punch above its weight. "South Korea stands in a very geopolitically significant and sensitive position that could affect the balance of power between the US and China. This has allowed the South to exercise diplomatic power that goes beyond its middle power status," said Nam Chang-hee, a security expert at Inha University. "The South also has unique historical assets, such as the decadeslong alliance with the U.S. This, combined with the geopolitical asset, created a unique situation for Seoul's diplomacy," the scholar added. More than a decade ago during the Roh Moo-hyun administration, the South once conceived the idea of playing a role as a "balancer" in Northeast Asia. But naysayers dismissed it as a nonstarter, arguing Seoul's diplomatic capacity did not befit that role. But history shows that Seoul, despite its weak stature in the past, triggered a notable change in the US behavior. In the early 1950s, South Korea's first President Rhee Syng-man pressured the U.S. to craft a mutual defense treaty through aggressive measures, such as the abrupt release of prisoners of war amid armistice negotiations to halt the 1950-53 Korean War. Despite its strategic focus on Europe at the time, Washington later signed the treaty that has evolved into a key mechanism to ensure security on the peninsula and beyond. The liberal South Korean leader Moon has maintained his diplomacy with the North despite a series of hurdles, including domestic skepticism. Just last year, criticism surged over his pursuit of engagement with the North that conducted the sixth -- and most powerful -- nuclear test in September and a barrage of ballistic missile launches later. His detractors derided his diplomacy as "weak and naive," calling on him to toughen his stance on the belligerent regime through measures, such as the redeployment of U.S. tactical nuclear arms withdrawn from the peninsula in the early 1990s. But Moon doubled down on his dual-track approach of constantly seeking dialogue with the North but maintaining sanctions to prop up his diplomacy. "What was unimaginable and impossible at the time when the Moon government took office is unfolding before our eyes," Nam Gwan-pyo, a deputy director of the presidential National Security Office, told reporters Monday. "All this was possible by the will of the leaders of South and North Korea and the United States to boldly break with the past framework and open a new future," he added. Apart from Moon's diplomacy, the growing nuclear threat from the North also contributed to the momentum for denuclearization dialogue between Trump and Kim. "In the past, the North's nuclear program was only a nuisance for the US," said Kim Tae-hyung, security expert at Soongsil University.